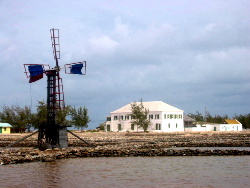 The White House was reopened in the early 30′s when Franklyn and his bride Marjorie Durham (of South Caicos), came to Salt Cay way to live. 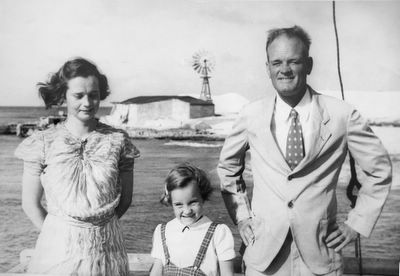 According to “The Bermudan”, a newspaper reporting their honeymoon, they were to “return home where they will constitute one half of Salt Key’s white population”. Franklyn was Rosalie’s father, and the last of the salt proprietors. Franklyn’s sisters were Gladys Hinson Harriott, a “maiden aunt” and Natalie Harriott Dunn, who is the grandmother of Tim and Jonathon Dunn. Natalie married Reverend Howard Dunn and had 2 sons, Michael and Ian with him. 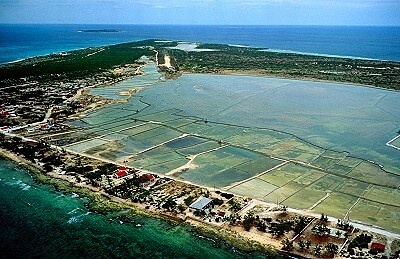 The term salt baron is one that Rosalie had never heard of until her return to Salt Cay in 1995. There was more than one salt proprietor on Salt Cay and no one was a “baron”. The Harriott’s were the largest proprietors of ponds, but they weren’t barons. Wealth was really relative. The Harriott’s were the only “whites” on the island, and had many things that most people didn’t have. They had “stuff” the Islanders did not have. Pay was relative to what the industry paid. But compared to what other people of the then “modern” world had, it wasn’t much. In reality, the depression was really the death knell of the Turks Islands salt industry. When Franklyn Harriott came to Salt Cay live in the White House, it was 1931. The depression was still very real. When the depression let up, war in Europe was going on. Remember, Turks Islands were part of Great Britain, so they were at war long before the US was involved. When the US entered the war and it went to a global scale, the salt industry was really in trouble, and shipping became impossible. Post war, when a 10,000 ton ship came to collect salt in the “modern” way, the three islands of Grand Turk, Salt Cay and South Caicos couldn’t fill the holds, and that really spelled trouble. Young men did not want to work in the salt industry for little or nothing, doing work that was beyond hard, long and boring. They left and never returned. In 1952 the Harriott’s left Salt Cay for good, going to Canada. Nationalization of the salt industry was the beginning of the end. Though preferred shareholders, there was not enough of a future in salt to keep it a viable industry and financial ruin was inevitable. This part, for Rosalie Harriott, is very difficult to discuss and share, but as a historian, they are the facts. Franklyn Harriott, the last of the Harriott proprietors, died of a heart attack at the age of 61 in 1960, a broken man. At 50 years of age, when he left Salt Cay, he could not get a job. He was extremely stressed which broke his health. His widow, Marjorie, lived on until 79 years of age, having owned a dress shop in Vancouver, BC and later working for a department store. This is really just a “nutshell” of the Harriott history, and one I intend to write and research in the months to come. It is a fascinating story and one I think many people will enjoy.